This is a report on my very first London Book Fair visit. The London Book Fair is an annual book fair where publishing professionals from around the world gather and talk about bookish business. This year it took place on the 14th and 16th of March at Olympia London, a massive exhibition centre in west London. As I said, this was my first visit. I had little idea what to expect and what to do before and during the fair. I wasn’t even sure if I wanted to go or not until I found out that AOI members could get 50% off discount on the tickets (Thanks, AOI!). So this post won’t be a guide to successful LBF experience. Having said that, I can tell you now that I had fairy satisfactory three days. I bought the ticket only a month before the fair, and only a week before the fair I tactlessly and cluelessly sent out messages to the publishers who were exhibiting (you can contact them via the LBF website if you register yourself), hoping to arrange a meeting to show my portfolio and picture book dummies. Result? Unsurprisingly no reply. On the first day, I woke up ridiculously early because I was paranoid that I might get lost or my train might get delayed (never trust London transport!). As yawning on the train to Kensington, I thought, ‘Oh wells. I don’t have any meeting lined up but if I’m lucky, I might be able to find someone who is kind to spare their time.’ Have I told you that I’m an optimist? And naive?? Thanks to my paranoia, I got to Olympia even before the door opened and I got a whole hour before the first seminar I wanted to go. So I aimlessly wandered around to see what the LBF was all about. The place was filled with small-to-large exhibitor booths, billions of books on the endless shelves, small tables and chairs, and many many humans. Soon I realised the fair was a quite businessy affair. I saw people in businessy outfits with piles of paper work discussing their businessy stuff at the small tables; not the creative types showing their portfolios and dummies as I had imagined. And of course, even if publisher/commissioning editors were present, their schedules were packed through out the day. No time to spare for some opportunists like me. However, my visit wasn’t entirely pointless. It turned out to be a great research ground for me. You can find publishers’ catalogues online these days. But it’s often quite big and inclusive so it’s hard to tell their preferences. But, at the fair, because of the limited space, publishers exhibit carefully curated selection, which I believe are their new releases and their favourites that they want to represent their brand with. It made easy for me to visualise if my books could comfortably sit among those books or not. Surprisingly, some of the publishers I had thought my books might fit gave me quite different impression at the fair. It was also a good opportunity to glimpse what the publishers in other countries were like. I really liked Gallimard Jeunesse from France and Corraini Edizioni from Italy. 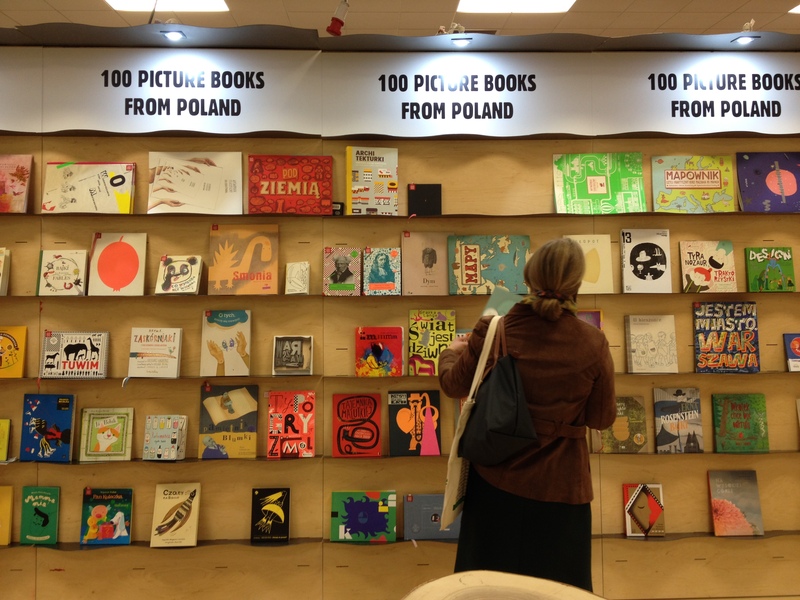 This year the LBF put a spotlight on Poland and it had a big exhibition space for Polish books. I was wowed by their children’s books. They were beautiful, very graphic and organic (as opposed to digital illustration). I was particularly inspired by this recipe book for kids called Ciasta, ciastka i takie tam by Agata Królak (Dwie Siostry). Even if you’re not a business person like publishers, book sellers and agents, the LBF is worth visiting because of those inspiring and insightful seminars, which are free for all visitors. There were more than 200 talks and discussions this year. I only picked seminars related to children’s books, but they almost filled up my three days. I really enjoyed the seminar by Sam Arthur, CEO and Co-Founder of Nobrow Press and William Grill, author and illustrator of Shackleton’s Journey and The Wolves of Currumpaw. They talked about how Sam had discovered Will at a graduation show and how they had developed Shackleton’s Journey together, and how it had led to their next project, Currumpaw. I love William Grill’s illustrations and the Currumpaw is one of my favourite non-fiction picture books, so it was interesting to hear about his developing process. Actually, I was surprised to discover that Grill was so young and pretty (for some reason I imagined he as an old hermit). To my amusement, he got surrounded by ladies after the seminar. But I was busy talking to Sam Arthur. He said the most important thing to get discovered by publishers was to show your clear and unique vision. Wise words. Writers of the Megaphone writer development scheme reciting their wonderful stories with cultural diversity. Author/illustrator Adam Stower and Tamlyn Francis from Arena Illustration taking about Adam’s debut middle-grade fiction, King Coo. Estonian/Latvian/Lithuanian author/illustrators talking about their beautiful books. Creators of comic books (Beano Studio, Rebellion, Kieron Gillen, The Phoenix Comic) talking about the future of UK comic books. Michael Morpurgo reciting his new book! Actually, I wouldn’t say the fair was fruitless as I managed to get some contacts. it wasn’t that easy though. Usually talking to strangers gives me mean butterflies in my stomach that make me mumble. But it was worth it. Each publisher’s booth had either receptionists or representatives from the company, so I went up to them and asked who would be the best person to send my submissions. I even managed to chat with a commission editor and she told me to send a book idea even if their website says they are currently not accepting MMS! Here is a tip: bring own bottle of water and food. You can buy them inside the fair but they are very pricy (a bottle of water cost £2.25! ).